Today we are releasing another massive update with lots of new capabilities that will be exciting for many of our customers, spanning from Power BI Desktop to the Power BI service. 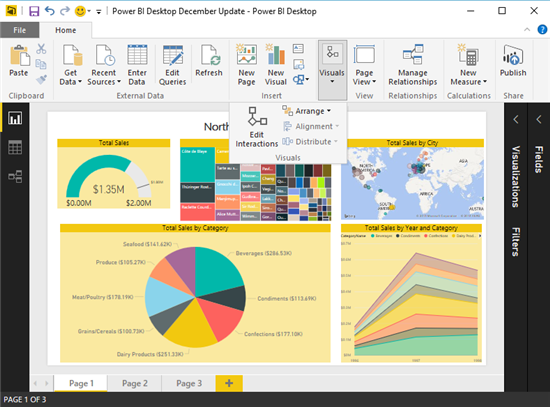 This update includes several new Report Authoring features as part of our monthly update for Power BI Desktop, which are also available in the Power BI service now for report consumption and lightweight editing. Before going into details about the new features in this update, we wanted to remind you about the Microsoft Data Insights Summit. On March 22-23, join hundreds of your peers, leading data analysts, and our product teams in Seattle, WA to talk about bringing your data to life with Power BI and Excel. Learn valuable new skills, test drive the latest technology, and schedule a one-on-one meeting with our engineering teams. 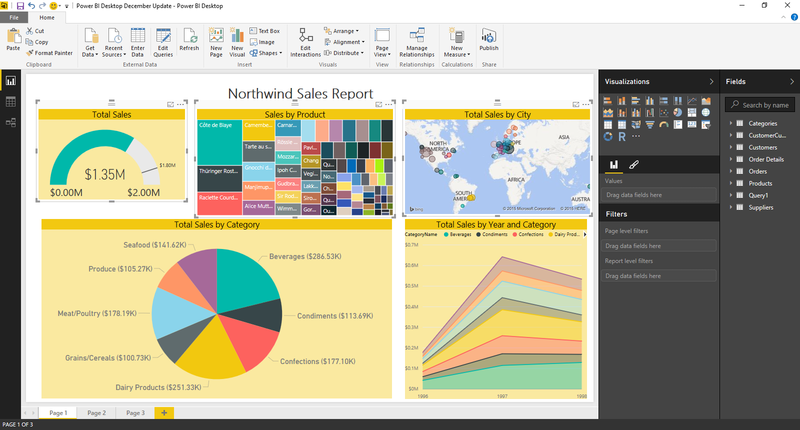 This is a unique opportunity for hundreds of Power BI users just like you to share and learn, and get new inspiration for your data. Attendee spots are limited and availability is filling up quickly… Learn more and register today. DirectQuery Improvements: Support for all data types of T-SQL and SAP HANA, resulting in Performance improvements. With this update, we’re making significant improvements to the Report Authoring capabilities in Power BI Desktop, which are also supported in the Power BI service for consumption and lightweight editing. We’re bringing lots of new formatting options, as well as new types of visualizations and several usability improvements. We have added more options to allow full flexibility in formatting charts where multiple measures are displayed. With this update, it is possible to format each measure within the chart differently. 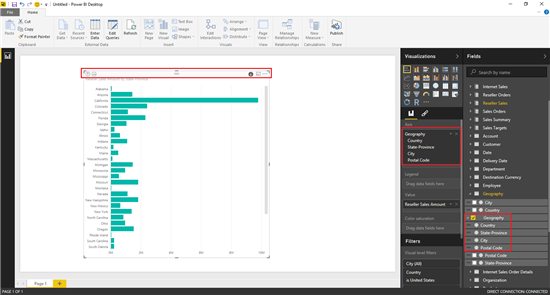 In order to achieve this, users can enable the “Show All” option within the Data Labels section of the Formatting pane for any given visual where two or more measures as used in the Values section. This allows users to specify formatting settings for each of the measures. Watch the following video for more details about this new feature. Users can now customize the number of decimal places showed in visuals (i.e. Data Labels). This option is available in the Formatting pane, under the Data Labels section. It is now possible to change the font size for text displayed in visualizations. This Text Size option is available in the Formatting pane. – Alignment Options: It is now possible to align two or more visuals by using the new Alignment options (align to left, center, right, top, middle, bottom). – Distribute Options: In addition to controlling the alignment between two or more visuals, users can also distribute three or more visuals, vertically or horizontally. This will ensure there is the same space between the visuals selected. – Size & Position: The Formatting pane now includes the option to set the exact size (width, height) and position (X, Y) for each visual. These options are available under the General section for any given visual. We’re introducing a new tool in Power BI Desktop that will save you a lot of time when trying to configure multiple visuals with the same set of Formatting options. Select the visual that already has the desired formatting options set. Click the “Format Painter” button in the Home tab of the ribbon. Click the visual for which you’d like to assign the same formatting options. – Title: All options apart from the actual text. – Data Labels: All options except Display Units & Decimal Places. – Data Colors: Default Color and, if the same field is used to drive color, copy the color/value assignments. – X-Axis & Y-Axis: All options apart from Start/End. – Legend: All options apart from the actual text. – Sentiment Colors (for Waterfall Charts): All options. – If options don’t exist in the target visual (e.g. 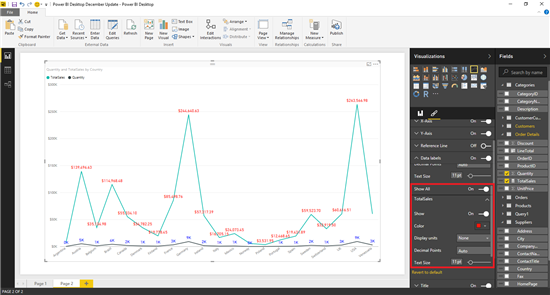 copying X-Axis options from a Scatter Chart onto a Column Chart) then they are just dropped. We’ve added a visual indicator on table column headers to indicate which column is being used to sort rows in the table. 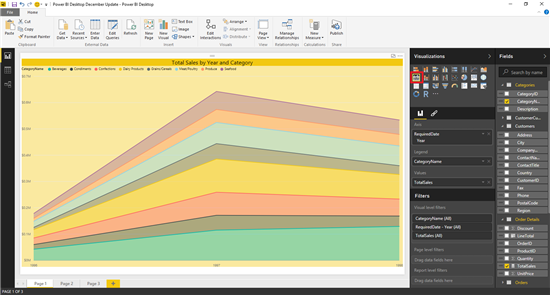 In this update, we’re adding a new type of visualization: Stacked Area Chart. This visualization can be found next to the Area Chart in the Visualizations pane. This new visualization allows a better representation of how values for multiple categories add up to the total for every given value in the X-Axis. We’re greatly improving Tooltips for Area Charts and Line Charts in this update. In one hand, we’re making it easier for users to see tooltips when they hover over one of these charts: before this update, users had to hover over the line or region in the chart to get a tooltip; with this update, users can hover over any point within the chart and we will display a tooltip with information about all points within the same X coordinate. In addition to hover behavior improvements, we’re also enhancing the information within the tooltip itself, so that multiple points are reflected in the tooltip. A reference line is also show to connect the points for which the additional information is displayed in the tooltip. 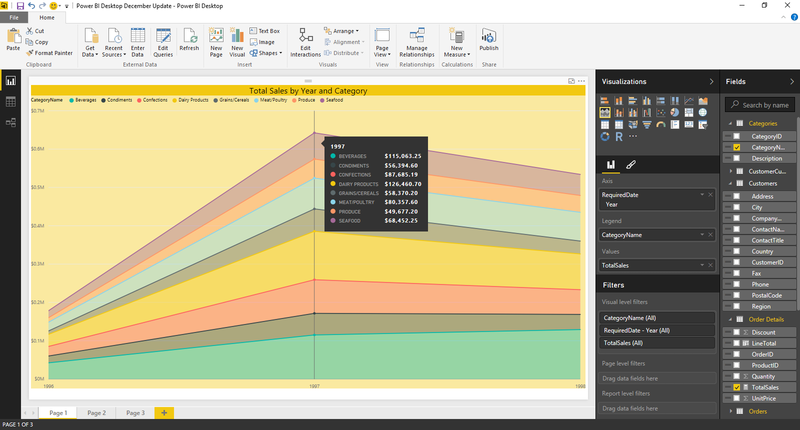 Users can now add Reference Lines to their Cartesian visuals in Power BI. This can be achieved via the Formatting pane for any Cartesian visual. Users will find a new Reference Line section in this pane, from which they can control the reference value (static value, for now) as well as the style and Z-Order of the line. The following video shows Reference Lines in more detail. We have optimized data labels in Pie and Scatter charts so that they make better use of the available space within the visual, in order to display data label values. In this update, we’re adding a new Preview feature that allows users to create visuals based on R scripts in their reports. In order to enable this feature, users need to turn on the option in the “File -> Options & Settings -> Options” dialog, under “Preview Features” tab. Once the preview has been enabled, there should be a new icon in the visualization pane. 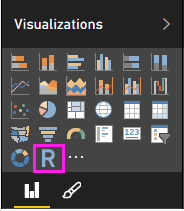 Users can click this icon in order to add an R visual. b) The R Script Editor will appear in the bottom of the screen. 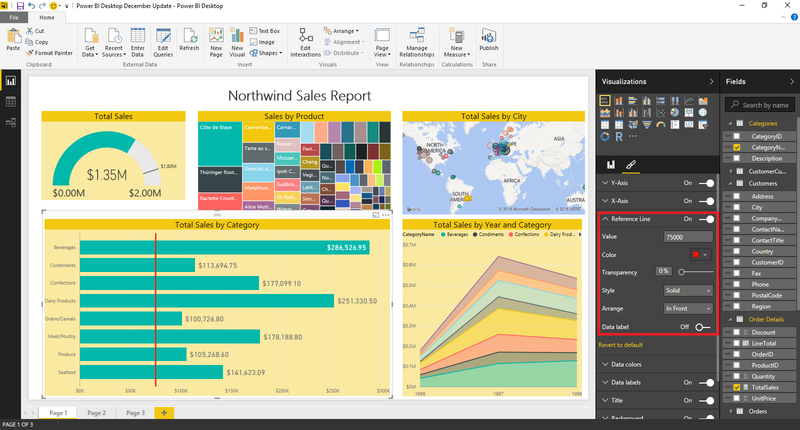 At this point, users can drag & drop data fields into the Values area in the Visualizations pane. This will allow them to reference those fields from the R Script Editor. After creating the R script, users can run the script which will render the results in the R visual in the canvas. When trying to create visuals involving multiple tables which are not related in Power BI Desktop, users will be able to automatically detect relationships or set them manually so that their visualizations work as they expect. 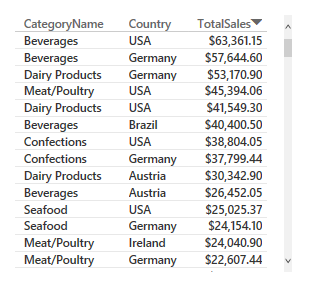 In order to access this functionality, simply create a visual involving multiple fields from tables that are unrelated. 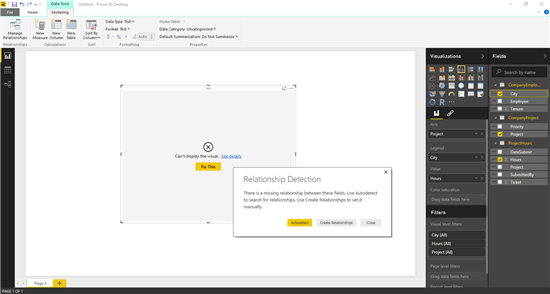 The visual will display a “Fix It” button and relationship detection will be triggered when clicking this button. In addition to all the new features mentioned above, we’ve also optimized the layout of the Home tab in the ribbon within the Report view. This allows for a better organization of the buttons and entry points to Report Authoring features. The report layout has been optimized also for smaller resolution displays, by applying smart collapse and grouping of related controls. Zooming Slider: Users can now zoom in/out within the Relationships view to see their diagram as needed. Fit Zoom to Screen: It is also possible to adjust the zoom level so that the content fits the screen size. Reset Layout: After applying some customizations (such as changing the position of a table in the diagram), users can click “Reset Layout” to go back to the default state. Ability to Zoom in using Ctrl-Mouse selection rectangle: Users can also use CTRL-Mouse selection to zoom into a specific area of their diagram, i.e. highlight a few tables and center the view on them. The last group of improvements this month is around Data Connectivity. 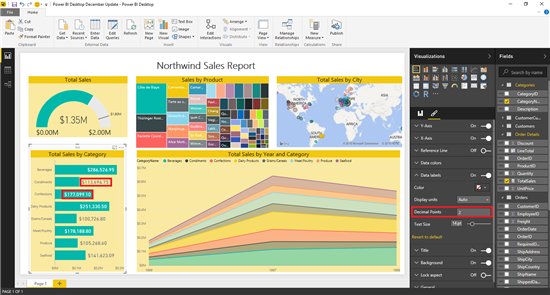 As every month, we continue adding new data connectors and enhancing existing connectivity and transformations capabilities in Power BI Desktop. 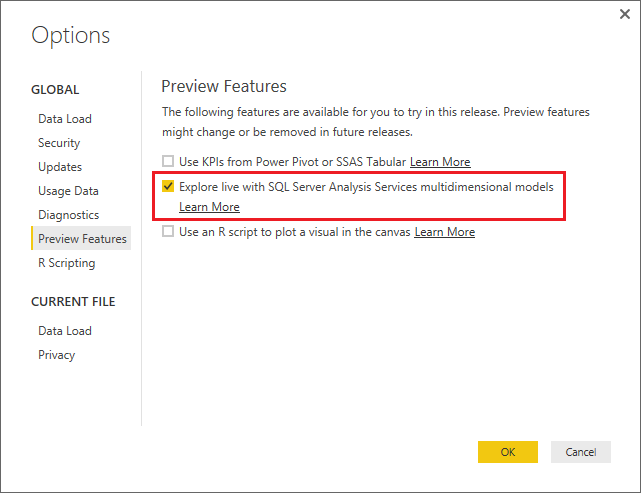 Last month we released a preview version of the Live/Exploration mode for connecting to SQL Server Analysis Services multidimensional models. This month, we’re enhancing this preview feature to support hierarchies defined within the multidimensional model. 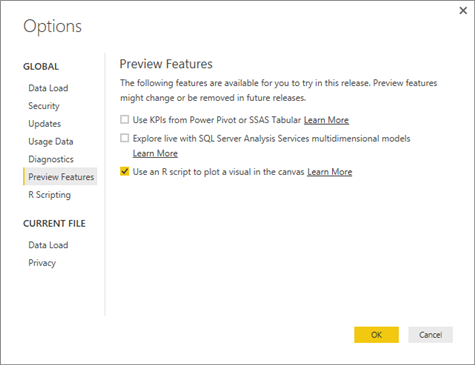 In order to try out this feature, you need to enable it via the Preview Features menu in the Options dialog. Once users have enabled this feature, they can access the “SQL Server Analysis Services” connector and specify “Explore Live” as the connection mode. 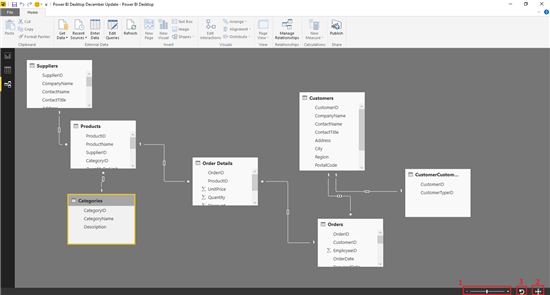 After selecting the model to connect to, users will be able to use hierarchies from the multidimensional model in their reports. We have added a new connector to allow users to connect to data in their Stripe accounts. Stripe allows businesses to quickly and easily manage online payments. This new connector enables users to create fully customized reports on top of their key metrics for charges, customers, invoices and more. 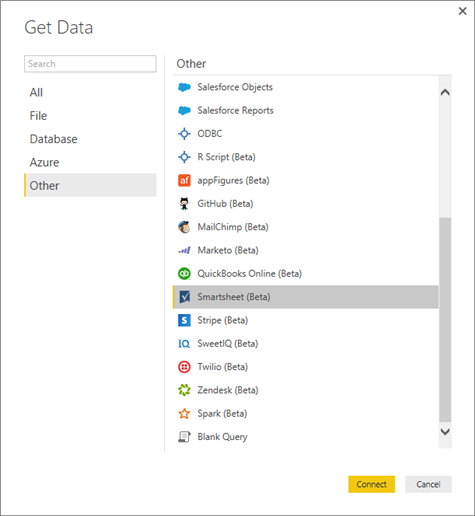 It also allows customers to combine Stripe data with data from any other connector available in Power BI Desktop. 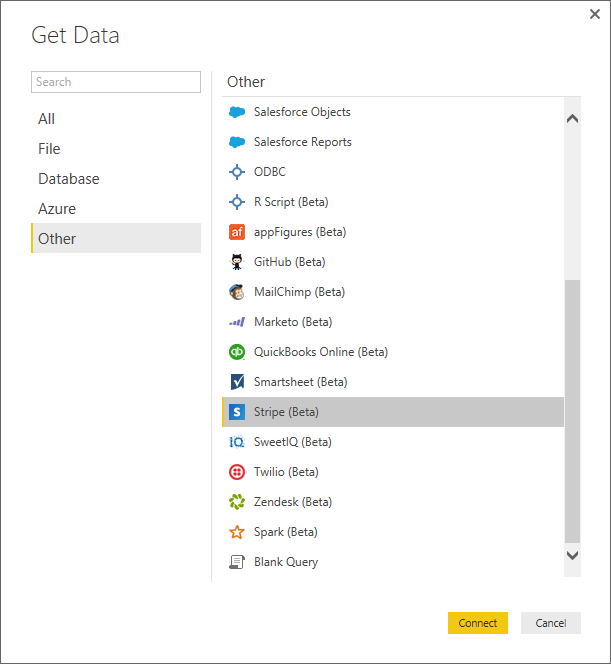 The Stripe connector can be found in the Get Data dialog, under the “Other” category. Another new connector this month allows users to bring in data from their Smartsheet accounts into Power BI Desktop, in order to create fully customized reports. The new Smartsheet connector gives users the ability to create reports that include information about their Smartsheet environments, such as workspaces, sheets and reports available, top collaborators and creators, etc. and identify key trends that help users understand how Smartsheet is being used in their organizations. In addition to creating reports based on Smartsheet data, users can also create reports that combine this data with any other data coming from a different data source supported by Power BI Desktop. The Smartsheet connector is available from the “Other” category in the Get Data dialog in Power BI Desktop. 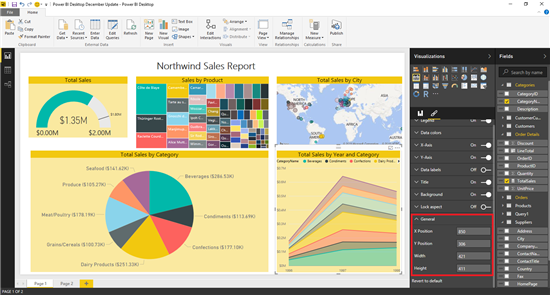 One frequent customer request has been about being able to create tables in Power BI Desktop by pasting some content or typing it manually. Before this update, this was only possible by manually editing custom formulas in either M or DAX language to recreate the desired data structure and content. With this update, we’re introducing a new “Enter Data” option so that users can easily paste content from the clipboard or type it manually as a starting point. Users can then decide to load this data directly into the Data Model for usage within the Report, Data or Relationships view, or even Edit the table upfront to reshape, enrich and combine it with other data within the Query Editor. From within this dialog, users can interact with a data grid to paste clipboard contents (CTRL + V) or type them in manually. 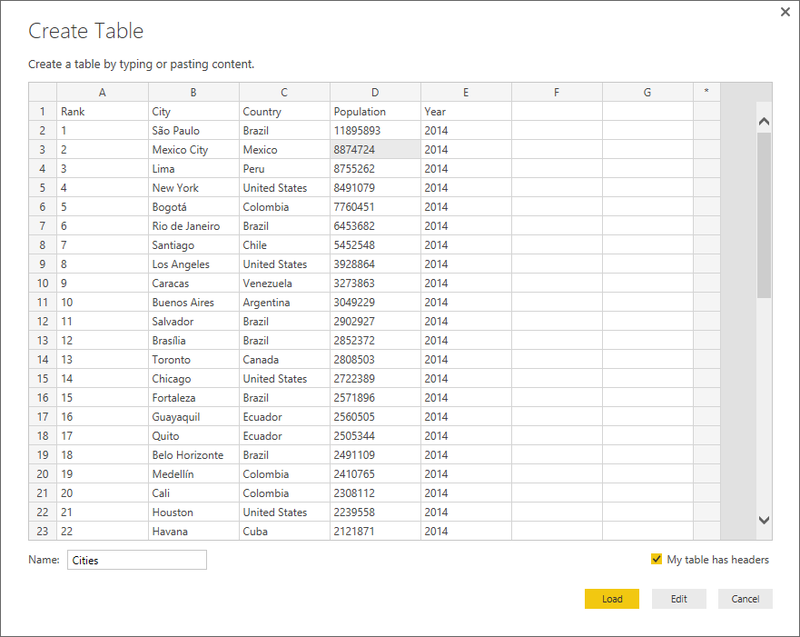 This data grid is fully interactive and allows users to cut, copy, paste content, insert or delete columns & rows, etc. Users can also specify whether their table has column headers or whether the headers need to be created automatically by Power BI Desktop. In addition to controlling column headers, users can also specify the desired name for the new table. 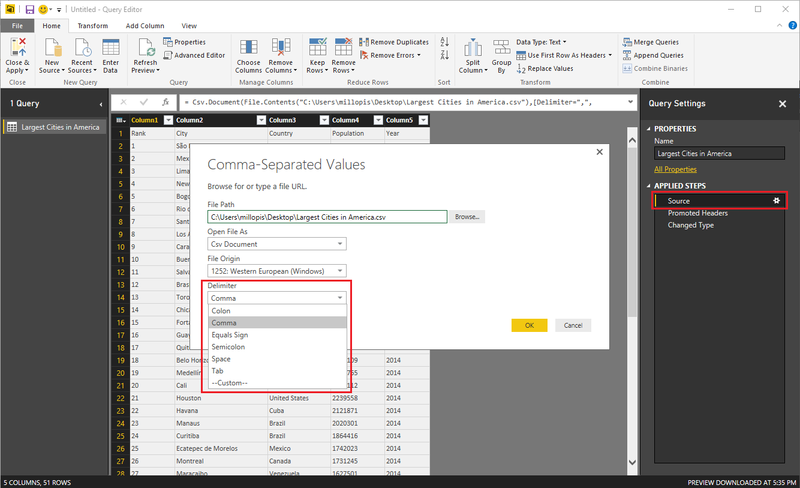 After defining the new table, users can load it directly or click Edit, which will allow them to perform additional transformations or combine it with other tables within the Query Editor. 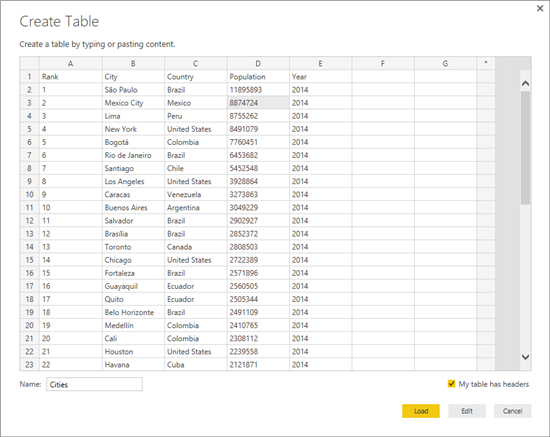 Using this new feature enables users to quickly create a data table and modify later as needed. It is useful particularly for small data tables which might be static or change very rarely. Creating a static table simplifies the overall data refresh process, as opposed to loading the table from an external Excel Workbook, CSV file, etc. which might not be available at all times, or not even needed (i.e. if the data never changes). We have made improvements to the DirectQuery mode capabilities, which now include support for all data types of T-SQL and SAP HANA. This will result in a positive impact on the Performance while working in DirectQuery mode. 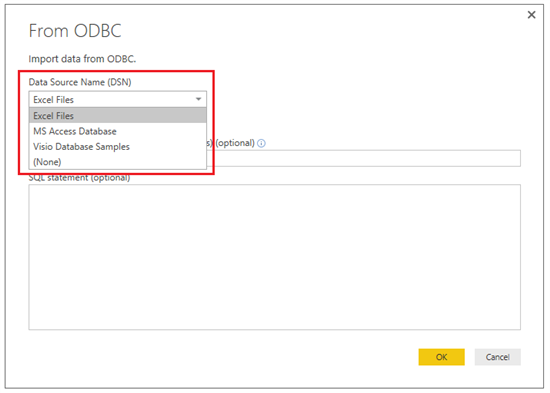 Another common request from customers using the ODBC Connector was being able to select from a list of available DSNs in their machine when specifying the connection details in Power BI Desktop. With this update, we’re adding a new dropdown menu so that users can select an existing DSN from the list of available User/System DSNs in their machine. 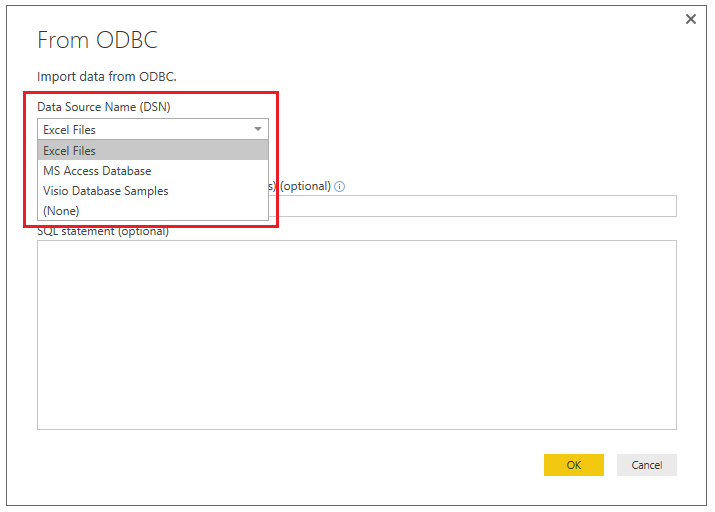 In addition to selecting an existing DSN, users could specify additional Connection String details, or select “Custom” in the DSN dropdown to specify a full Connection String independently from any existing DSNs (equivalent to the behavior prior to this update). Last but certainly not least, we’ve improved the Source dialog for the CSV Connector so that users can customize the Column Delimiter option. Before this update, the Column Delimiter option could be modified only via editing the underlying M formula for the Source step.